TMJ is the Temporomandibular Joint and often the root of pain for lots of patients. This pain can range form minor popping & clicking of the jaw, to severe pain such as facial soreness, full feeling in the ears, ringing in the ears or even daily migraine headaches. This particular patient is not the typical TMJ age of 28-45 but only 17. We started TMJ treatment on her about a year and a half ago. She came to MOD Squad complaining of all the severe symptoms mentioned above. As you can see from her before and after photos, her bite was not correctly aligned causing her lower jaw to be canted back into her ear canal causing all of her pain. Her first step in treatment was to place a corrective TMJ orthopedic splint. She wore the splint 24/7 with weekly adjustments. Her pain was quickly alleviated by the splint. 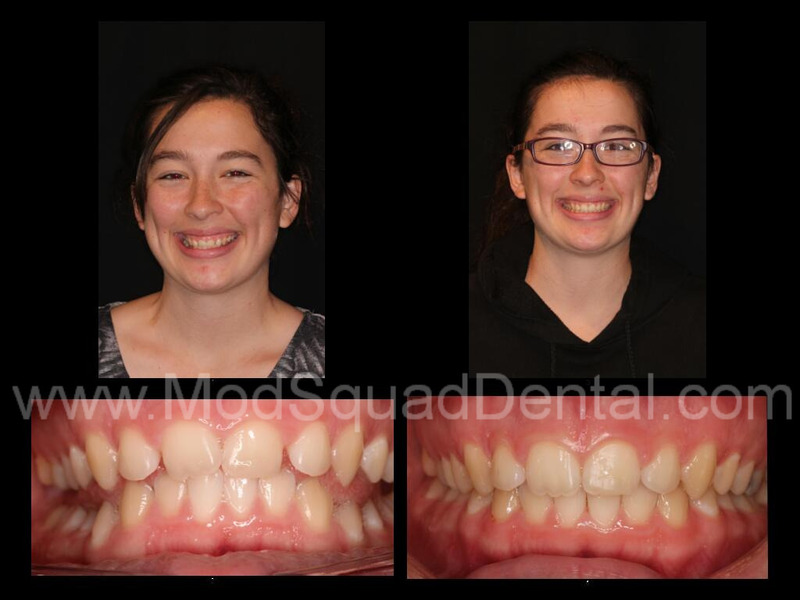 Once the patient was pain free and stable for 3 months in this bite position, Dr. Friedman placed her in traditional braces to move her teeth permanently to where the splint was holding her correct bite position. She is now pain free and actually represents that smile on her face both inside and out. If you or someone you know suffers for TMJ pain, phone Jess today 858-547-0070 for your complimentary consultation.